The new Microsoft Office was unveiled earlier today by Steve Ballmer at a media event in San Francisco. Following the trend set with Windows 8 and Windows Phone, Microsoft is reinventing Office to adapt to the times and remain competitive in an increasingly tough market. Let's take a closer look at how that's working out with the new Word 2013. Normally when I fire up Word, it just opens a blank document, but Word 2013 it takes you to a landing page. The page is similar to what you'd see in Word 2010 if you start a new document from a template: In a pane on the right, it hosts various thumbnail images illustrating the different templates; and in a smaller pane on the left, it lets you select from recent Word documents or open other existing files. 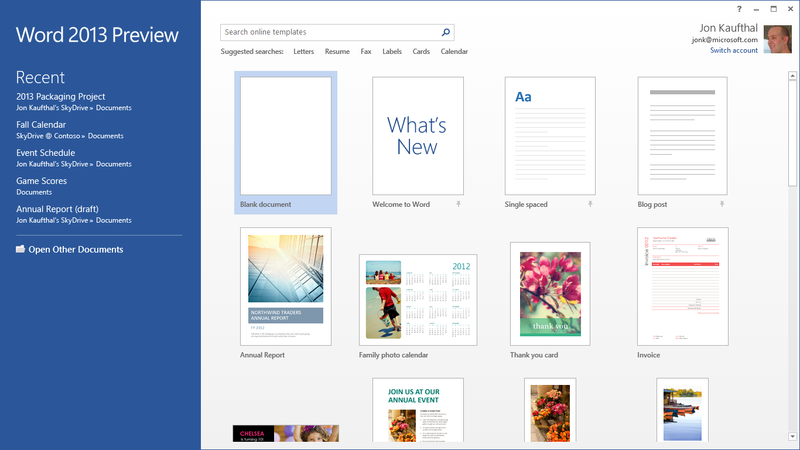 The Word 2013 Start Screen lets you select from various templates.I've always liked the ribbon bar, and I'm glad to see Microsoft embracing it across virtually all of its products--but I realize that many users loathe it. Word 2013 adopts a hybrid approach that should work for both parties. The ribbon bar exists, but an arrow on the far right allows you to collapse it so that it appears to be a simple menu of links across the top. When you click a link, though, Word opens the associated ribbon interface instead of an old-school drop-down menu. Microsoft is pushing users strongly to work with the cloud. Windows 8 encourages users to log in with a Microsoft ID, as opposed to a local Windows account; the ID connects you to your associated SkyDrive storage, and enables your Microsoft programs to sync settings and information. In Word 2013, you can choose to save files locally--or wherever you want--but SkyDrive is the default storage location. Microsoft lets you know up front what the consequences of saving a file in a particular location might be. As you choose different locations--SkyDrive, your local computer, or another device--to save a file, a bulleted list pops up at the bottom of the Save As display to let you know whether the file will be available offline or from other devices, and whether it can be shared with others from the chosen storage location. Saving files on SkyDrive has some advantages aside from supporting access from other devices and allowing you to share them with others more easily. Most notably, Word 2013 remembers where you are. If you stop working midway through a document, Word 2013 bookmarks your position. When you reopen the file--even if you do so from another device--Word 2013 can pick up where you left off. 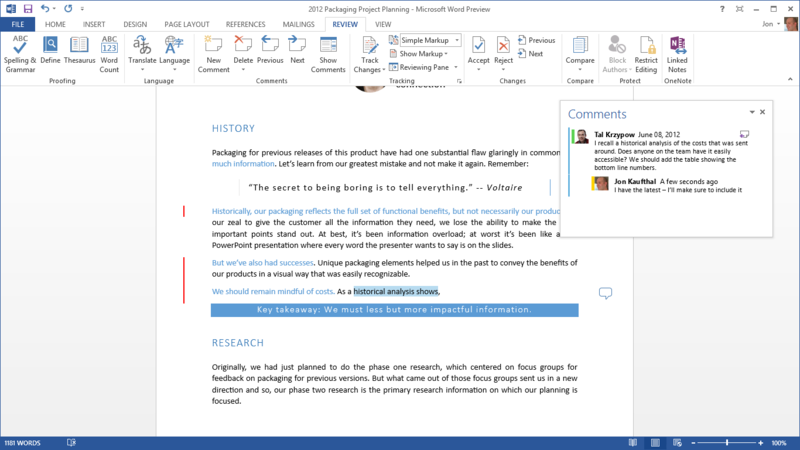 Word 2013 lets users reply to comments, to maintain a cleaner discussion thread.I particularly like two new functions for collaborating and editing. First, you can now reply to a comment. I do a lot of editing, and having a "discussion" in the comments tends to be sloppy and chaotic. Word 2013 lets you click to reply and maintain the discussion thread in a single comment. The second feature I like for editing is the ability to lock tracking changes. You can set a password to lock change tracking on, thereby ensuring that all changes and modifications are visible as such. Microsoft's new generation of software pays close attention to touch. You can tap charts or images to zoom in; you can tap to expand or collapse sections of a document; and you can hold your finger on a word or phrase to access context-sensitive options. Microsoft expects Word 2013 to be used with touchscreen interfaces. My overall impressions are positive. Microsoft seems to have done a solid job of adapting the traditional Word--or at least Word 2010--to accommodate new features and enhancements that make the software much more functional on tablets and other touchscreen devices. The nudge toward the cloud will help protect data, simplify file sharing, and give users to have consistent access to information from virtually any device.